A cautionary tale of an early attempt to put AI on an IoT system that detects when elderly people fall. Who knew falling was so complicated? “I don’t want to work on a fall detection system ever again,” said MbientLab CEO Laura Kassovic in front of an ARMTech Con audience. 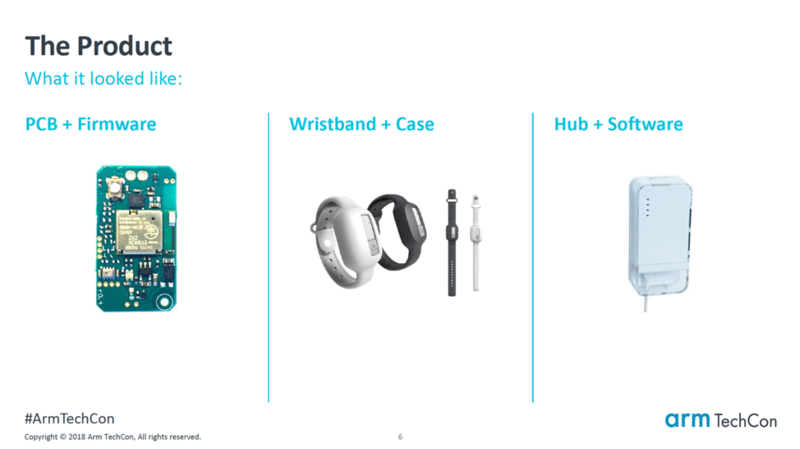 The audience laughed as she flashed a picture of what could now be a better approach—the Apple Watch Series 4, which had recently been announced. A few years ago, MbientLab helped a client design a fall-detection system for nursing homes. The system would consist of the patient-worn devices and hubs placed around the facilities. It had to detect when the person wearing it had fallen and signal someone to come help. The wrist-worn sensor had to be lightweight, comfortable, waterproof (for showers) and attractive enough not to be discarded by patients. All this on a seven-day battery, USB rechargeable. MbientLab’s client decided to hire a separate data science firm to gather the data to train the system to allow Kassovic’s group to concentrate on the system design and manufacturing. The data science firm’s deliverable would be training data in C code. 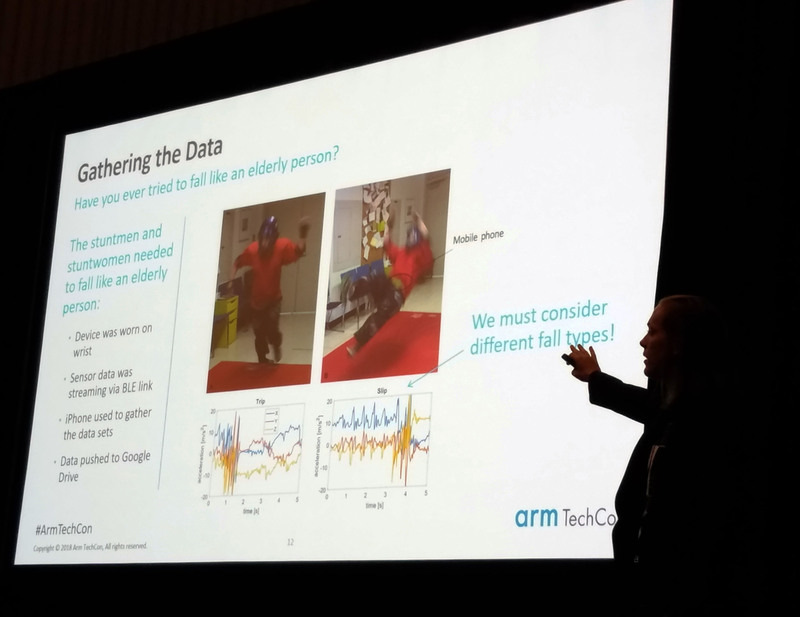 “We couldn’t push grandma down the stairs,” said Kassovic, so instead, the client’s data science firm used stunts people to fall like elderly people while wearing the sensors and streaming the collected data up to the cloud via iPhone. This data would be used to train the system. This is when things started to go wrong. “Never hire a data scientist to do a firmware engineer’s job,” said Kassovic. Embedded systems 101 says think small: your system is constrained. These data scientists, however, were used to crunching numbers on “fancy systems” with a lot of power and memory. The data team used Python to clean the data and then wrote a C program for the inference algorithm that would detect fall incidents. The algorithm they provided Kassovic’s team was huge. It took too long to make an inference and was too power hungry for the wearable system. “Basically, the first time they ever gave us the code, it didn’t even compile,” said Kassovic. The next mistakes the data scientists made were basic, but important. “When they trained it on their like 14-billion-core machine, they had the good old floating point that we do not have on the M0. So, they train their entire net so the algorithm that came out of it was floating point, had floating point or used floating point. Couldn’t do that,” said Kassovic. “We had to yell at them. They basically used all of our RAM.” The system crashed all the time, and whenever new data came in, it took over 10ms for the algorithm to run. Using all the sensors was also a problem. “The biggest problem too is that because it used all the sensors, algorithm would kill the battery on our device in about a day, which wasn’t ideal. They need to just get rid of a few nodes, because this thing is like the biggest algorithm known to man …it was ridiculous,” said Kassovic. The device also would not work anywhere above sea level. The data team—also based in San Francisco, Calif—at sea level— ran their training data in Pascals. The system would work in San Francisco but not in Denver. MbientLab told the data science team to use relative altitude in meters to train their net and not absolute Pascals, “because that was the silliest thing I’ve ever heard,” said Kassovic. “We ended up telling them how much RAM and flash they had and that they couldn’t go over, what the runtime had to be. And so, every time we’d retrain the net and they would give us some more code, we forced them to tell us everything about it, like is it going to fit? Is it better? Is the accuracy better than before? And then we would say okay, we’re going to go ahead and release this as a product. This will be the new firmware that goes out to those nursing homes.” The detector is now used in about seven rest homes under a subscription model.